The Patton 460F G.703 baluns continue to be hot sellers for us. These units handle balanced to unbalanced impedance matching so that equipment using 75 ohm coax is not mismatched to equipment using 120 ohm twisted pairs. European telcos typically offer 120 ohm twisted pair terminations, but many applications use only 75 ohm coax. 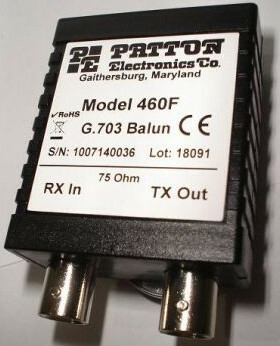 The Patton 460 baluns take 75 ohm signals and covert them to 120 ohms entirely consistent with the G.703 standard. These units are in sufficient demand from our European and Central American customers, and from North American Companies who have projects overseas, that we keep the Patton 460F, and the Patton 460RC/16/F populated balun panels, IN STOCK.